I know it's been months since I found my way back here...or even back into a book. It's been a long, hellish year and I found that even reading couldn't get my mind off things. So I took a long vacation. Just before Christmas last year, my dad was diagnosed with cancer. It started in his lungs, but wasn't caught until a tumor grew on his spine so big that it broke a vertebrae. So I spent a few weeks at my parents' house to help out after his surgery. He started treatment in January and went through 5 months of radiation and chemo before he decided he had enough. By June, it had spread to his brain, and by August, he was confused, agitated and gasping for breath. After a few weeks in hospice care, he finally let go. He was 3 moths away from his 70th birthday. My dad was a man who was bigger than life. Charismatic, with an infectious laugh and easily the smartest man in any room, he lived his life through logic, rationality and truth. I learned so much from him and yet it feels like I never knew him. He kept so much hidden, right down to the very end. This was the man who patiently taught me to read when I was 3 and always urged me to learn, to question, to take everything with a grain of salt. It's been 2 months since he passed, and there's a big hole in all of our lives, his passing left ripples that will reverberate for the rest of our lives. I miss you, Dad. I hope and pray that you're somewhere with your family, laughing and finally getting the answers to all the genealogy riddles you spent years trying to untangle. And know that life goes on for us, but just a little dimmer that you light is gone from our lives. Belle Meyer, the proprietor of The Wild Goose culinary shop in Walnut Creek Square, knows she sells some great cookware but never thought it was killer cookware until one of her customers is found dead – smacked with a frying pan from her shop. Belle can’t help but do a bit of poking into the matter, much to the consternation of Detective Hawkes. What a fun, charming little book! 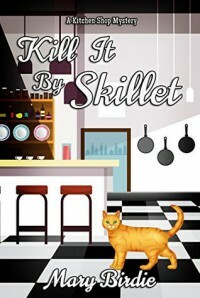 It puts the “cozy” in cozy mystery with a cute small town, an adorable cat, fun characters (many of which had food related names, which made me smile. Nathan Eclair!) and lots of food related quips sprinkled liberally throughout. I enjoyed the plot, there were a lot of suspects, some who seemed more likely than others. There were lots of twists to keep me guessing and the reveal at the end was a little surprising and very satisfying. 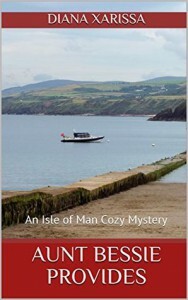 A very enjoyable book and I look forward to reading the next one in the series. I would’ve loved to see a few recipes at the end of the book, some of the demos Belle made in the shop sounded divine and I love a good baking project. And the measuring spoon necklace given to Belle by her boyfriend Kenneth made me realize this was something I never knew I needed in my life! Curator Chloe heads to Green Bay to consult on the restoration of an old Belgian-American farmhouse. 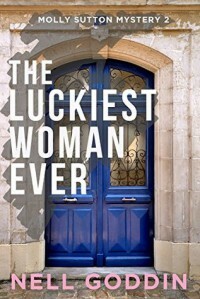 When she arrives, she can't help but check out a historic summer kitchen - and discovers a dead body in the bake oven! 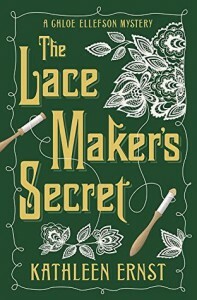 Alongside the the bake oven mystery is the tale of Seraphine, a Belgian immigrant skilled in art of making lace. The hardships she faced forging a new life in Wisconsin in the mid 1800s provided a background for the events in the modern day mystery. I can think of 2 authors off the top of my head who wreck me with their books and #1 is Kathleen Ernst. I just know this review won't do the book justice, it's so hard for me to detail why this book was so remarkable without giving away what makes it so remarkable! 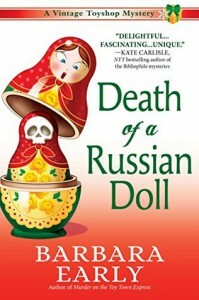 The author's ability to weave an emotionally haunting old-world story with a gripping modern day mystery is hypnotic! Just like Memory of Muskets, it will stay with me for a long, long time. Seraphine's strength in the face of such adversity and heartbreak was inspiring and the very detailed descriptions brings it all to life. It's one thing to read about life in earlier times, but the events are narrated so vividly, it's like being there. There was a lot packed into this book without feeling burdensome or overwhelming, from Roelke's struggles to Seraphine's heartbreak to Chloe's tenacious investigating, and the lessons are all the same; strength, faith, and family will help you through any hardship. There's no better message for anyone to take away from this and I think it's what sets this series apart from so many others; that it effortlessly entertains, thrills and inspires. Oh dear, now I'm waxing poetic but really, this was an excellent 5 star read that kept me glued to the pages. Can't wait for the next one! It’s always a pleasure to sit down with an Ed James book, because I know it will be a deftly plotted, action packed thrill ride and In For the Kill lived up to the hype. 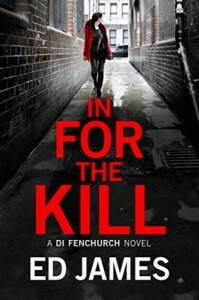 Fenchurch has a lot on his plate at the moment, with dealing with the aftermath of finding Chloe, his long ago abducted daughter, his wife nearing the birth of their second child, and a the terrifying case of a college co-ed found murdered in her bed at the same university Chloe attends. 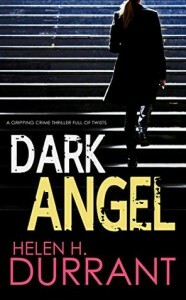 This was a great read, I loved the thrilling fast paced chase through London solving this complex crime. There were one or two points where the pace slowed a bit, but not by much and there was a lot of action to keep my pulse racing and the tense atmosphere kept me turning pages, impatient to see the next bombshell. Although I missed a few books in the series since I read the first book, I was able to get right back into it. Thanks to the great character development and the consistency of the writing, I remembered many of the principal characters, making me feel like I was catching up with people I hadn’t seen in a while. Fenchurch is developing as the sort of hangdog character you can’t help but root for; intense, persistent, stubborn, and fallible, there’s a little Fenchurch in everyone I think. I enjoy watching him methodically pick at the threads of the crime until it all unravels alongside coping with the struggles in his personal life. Overall, a great read with a fascinating case full of twists and turns to keep me guessing. Definitely recommend for fans of dark and gritty police procedurals. This one has been on my To-Read list for awhile and I absolutely loved this well crafted slice of life in the Victorian times and the fashionable rise of Spiritualism. When a new phenomenon in the form of a spiritual medium named Miss Eustace takes Brighton by storm, Mina becomes worried that her mother and her financially well off friends will become the victims of fraud, Mina sets out to investigate the woman, her intentions and her mysterious past. 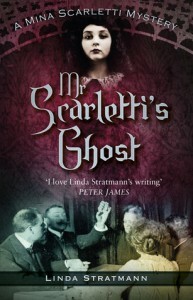 Afflicted with scoliosis, Mina Scarletti isn't expected to marry and have children, so she is free of many of the constraints and pressures that other Victorian women would face. She's already a successful author of horror stories, and her skepticism of the Spiritualist sensation sweeping Brighton has her free to do a little investigating without arousing displeasure from her family or the townspeople. Practical, clever, sensible and creative, she's fascinating and so gosh-darn likable. Along with her brother, Richard, friends Dr. Hamid and his family (Oh! Eliza's storyline was so sad!) it made for a warm and inviting read. I love the level of realism in this series, it reads like non-fiction. Beautifully researched and rich in detail, from the descriptions of the Brighton seafront to Miss Eustace's demonstrations, it was brought to life handily and it was so easy to lose myself in the story. I also enjoyed that this was a clean no-murder mystery, just good old fashioned intrigue and deception. This is a a definitely a very highly recommended series for anyone who enjoys historical mysteries and a perfect pool read. Don't miss this one! Someone's trying to frame Hurley, from killing his ex-girlfriend to burning down David's house with Hurley's gas can to attempting to abduct Mattie. But who and why? 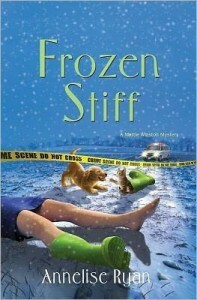 Under suspicion, Hurley goes on the run and enlists Mattie's help in figuring out who's behind it all. Good, but not great. I didn't devour this one like I did the other books in the series. I can't put my finger on why, some momentum was lost after the second book. But there was a lot to like in this one, from more background on Hurley (who is the series's least developed character, IMHO) to the old detective Bob (the gym scene made me laugh out loud!) to the great plot with a surprising twist at the end, there's no way I ever saw that coming. Although enjoyable, I found myself putting it aside in favor of other books more than once. I couldn't put this one down, I'm sorry it took me so long to start it! I've long been a fan of Helen H. Durrant's Calladine and Bayless books, but this is my first DI Greco. I can safely say this can be read as a standalone or an entry into the series, I wasn't lost at all, any prior references are explained enough that they're not a distraction. First off, I have to say that Durrant is skilled in drawing in a reader completely into the world she creates, making the book so much more than a gripping mystery (as if that wasn't enough! ), but also the frequently messy lives of the very compelling and realistic (if not flawed) characters. You end up with not only a thrilling case that keeps you turning pages, but also the can't-turn-away-train-wreck that is Greco's personal life. I like Greco, he's unemotional and methodical, traits that frequently cause problems with interpersonal relationships. Reading this, I was reminded Olympia Dukakis's line from Moonstruck ("Can I give you some advice? Don't s**t where you eat.") and boy, is that relevant to this book. Still, I felt for Greco, it was clear he was being pushed into something he didn't want and that never ends well. But it's the case that takes front and center in the book, it got off to a running start with a body found at a music festival by a young woman before turning to the murders of two young men who got more than they bargained for when they burgled a house. The quick pace and many twists and turns kept me greedily turning page after page and that surprise ending left me gasping. An excellent read from start to finish, something I always expect from this author and definitely recommended for fans of gritty crime fiction. Poor Liz, her promising new romance with new police chief Ken Young was shattered when his estranged wife, Marya, blew into town looking to reconcile. Liz does her best to get over it, but when Marya is found strangled to death and Ken comes under suspicion, Liz steps in to help her dad solve the murder and uncovers the secrets Marya has been hiding for years. But who killed her? I'm a bit late to the Ripple Effect series, this is the fourth book but only the first I've read and I can safely say this can be read as a introduction to the series or as a standalone. 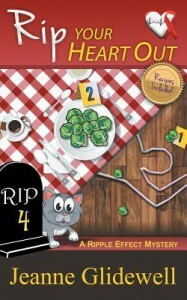 Following the adventures of retired couple Rapella and her husband, Rip, as they travel around the US in their RV, they find themselves in the middle of a mystery wherever they go. Rapella, a charmingly naive chatterbox, made for an entertaining sleuth (and I enjoyed Itsy as the sidekick!) and I was drooling over the beautiful scenery on their cruise. Add in a mouthy cockatoo, a sweet St Bernard and a zippy, lively plot and there was a lot to like! The plot, surrounnding an anonymous tip that a local woman's death was not due to natural causes and is later determined to be murder. Suspicion is thrown onto Sydney, one of Rip's cardiac nurses and the niece of the recently decesased woman. 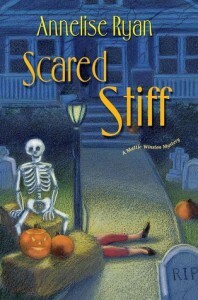 There were many facets to the plot, from the seemingly "haunted" house to the squabbling siblings to the possible cache of missing gold and I was sucked in from the start. From the breathtaking scenery on the cruise that made me drool to the many lovable (and not so lovable) characters that jumped off the page and the hijinks that Rapella got into had me chuckling (especially the Uber part!) 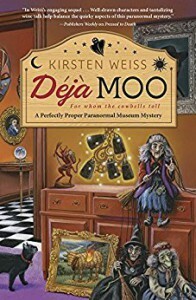 While I read a lot of cozy mysteries, there have been few that were as fun as this and and I'm definitely going to read the other books in the series. I really like these cold case stories, and this one was intriguing; Constable Hugh Watterson brings Bessie a cold case of a man's body found twenty years ago on the beach and after looking into the few men who left around the same time, only two are unaccounted for, so which one was the man on found on the beach? It's always fun to watch as Bessie and her police friends brainstorm over take-out and hash out the investigation, and the many twists and turns kept the pace moving quickly. And as always with the Aunt Bessie books, it's not just the mystery that keeps me coming back, it's also the on-going evolution of the characters and the charming world the author has created. A light, enjoyable read, perfect for a rainy afternoon. Heh. Poor Mattie doesn't have an easy time of it, does she? During a blind date with the OCD William-not-Bill, Mattie is called out on a dead body call. Shannon Tolliver was found dead in her front yard, amongst the Halloween decorations. When Shannon's estranged husband Erik is arrested, Mattie knows he's not the killer, so the real question is: who killed Shannon and why? Just one thing, I've got a Dropped Thread Alert! Overall, an excellent second in this series and it made me excited to read more. 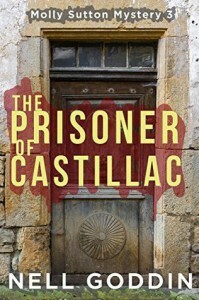 Seven years ago, a beautiful young woman vanished without a trace from Castillac, haunting the villagers and the Gendarme. But when a clue, in the form of a note left on the door to the police station, saying Valerie has been spotted alive, but no further details. Former head of the local Gendarme, Ben Dufort, hears about the note and enlists Molly's help in an informal investigation. With no evidence, no other clues and nothing to go on, can Molly and Ben find Valerie? And who left the mysterious note? 3.5/5 stars. This one was enjoyable but got a bit tedious after about half. I liked the resolution of the mystery behind Valerie's disappearance but I think it would've done better as a side plot, or if there had been some kind of side plot. Most of the book was really just a series of missed opportunities and while that makes for some tension and suspense, it wasn't meaty enough to be the sole focus of the book. But what really bothers me is what's not in the book:, some details get skipped over and at the end of the book, it's all resolved. This is something I've noted in the other 2 books; in the first book, it was the ending. One minute you're in the middle of the exciting ending and the action cuts off to Molly telling her story at the pub. In this book, it was all the action outside of the main plot (which, as I said, wasn't really enough to span a whole book.) Ben Dufort, who has now resigned from the Gendarmes, is barely in the book, there are very few scenes with him and Molly and at the end they're kissing and holding hands. Wha? I realize that the series has been leading up to this, but it just seemed out of place and not fleshed out. I would've liked to have seen it come about more naturally. So, this was good, thanks to the excellent characters, but the plot (or lack thereof) held it back from being a 5 star read. At the local fine dining restaurant, Molly eavesdrops on a wealthy old woman's not-very-happy birthday party. Known throughout the village for being contemptuous and unlikable, her assembled partygoers look less than thrilled to be there. At the end of the evening, Molly finds the woman lying dead on the bathroom floor and it's determined that the woman died from cyanide poisoning. Molly, having witnessed the whole evening, begins to investigate (which is a good thing, since the local police chief isn't very good at solving murders.) What she uncovers is decades of secrets, lies and a rage that has simmered for decades. This is quickly shaping up to be a favorite series, I'm really enjoying Molly's adventures in France. This one introduced some new characters that I hope will be returning. And the victim! While a nasty character you love to hate is common in books, this one really takes the cake. She was gleefully hurtful, thoroughly vile, and mercilessly horrible and yet I still loved her antics (or maybe I was just waiting for the moment she paid for it, I don't know. But what a delightfully rotten character! Really, if I wasn't so wholly caught up in the story, I probably would've figured out the clues, but no, it all just flew past me. Lots of red herrings threw me off track and the pace was perfect to keep me turning pages. The ending was a lot better than the first book; I was riveted, watching it all unfold. This was a thoroughly enjoyable cozy read, perfect to curl up with, especially if you have a croissant and a glass of fine wine. I'm currently in the middle of 3 books and all 3 have become really annoying for one trope or another, which makes me not want to read anything at all. Reading my way through the Mattie Winston series and was going to add the next book to my currently-reading list on Goodreads and discovered I....already read it? So I thought, must be a glitch or something. But no, there's a review? WTF? I have no memory of having read it! Now, you may be saying to yourself "Well, you do read a lot..." but I usually remember books I enjoyed.